houseofcards, houseofcards, micheljq and 11 others like this. Lots of folks in the cichlid world overstock to control aggression. I myself never did and I personally find it to be a horrible idea. Understocking is a much better way to go. The fish have much less stress. If something happens to the tank it is easier to get under control. Disease outbreak does much less damage and is easier to cure. There is much less pressure on the bio-filter. These are just my way of doing things and I am not by any means saying they are right for everyone as there a lot of heavily stocked cichlid tanks, it just isnt for me or my style of fish care. Am I on Candid Camera? BadApple and BadApple like this. thedood, thedood, Leeatl and 7 others like this. No, Confessions of a taxi driver! houseofcards and houseofcards like this. IMO it depends on the situation. I would not overstock a small tank with large fish, but I would overstock a large tank with small fish. I could also understand overstocking as long as the fish will occupy different levels of the tank, that way they will not overcrowd each other. IMO there is a difference between overstocking and overcrowding. I think that if the tank has plenty of swimming room, plenty of hiding spots, the fish species are chosen wisely, and large water changes are often then overstocking is possible without negative affects. lnstevens, lnstevens, TheAnswerIs42 and 3 others like this. Depends on the definition of overstocked. Any amount of fish that can be housed and kept healthy and stress free, with no aggression between them, is by definition understocked. lnstevens, lnstevens, Jirajustin and 3 others like this. Understocked aquariums are easier to maintain and have less risk involved. 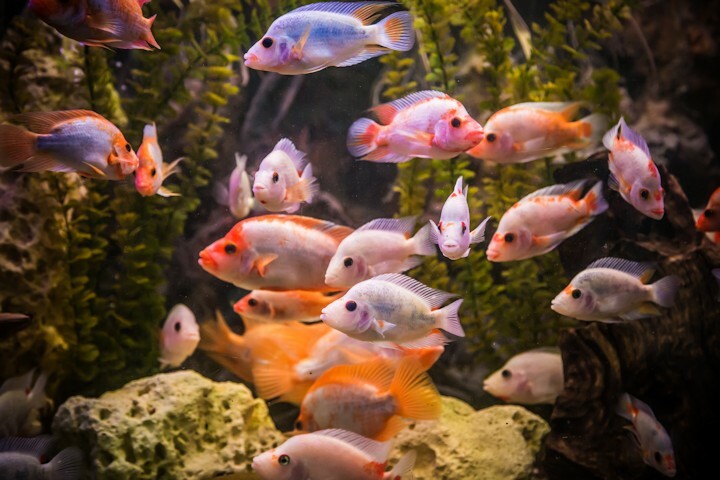 Overstocked aquariums require more work to maintain and have more risk involved. It all depends on how much time, effort, and money you want to put into it. Always consider the quality of life you can give to the plants and animals in your care. Olskule, Olskule, lnstevens and 1 others like this. Last edited by Acro; 04-09-2016 at 10:36 AM. Reason: . I guess for me you would have to explain what over stock is. If the fish are growing and healthy are they over stocked? This isn't the wild theses are our pets and if they can have life that has less stress and they feel comfortable and the really only way to know is to watch how they react and grow. So yes you can over stock with two fish but yet not with 30 fish so it really depends on each tank and it's owner. I've kept pretty well stocked tanks for many years. Some would call overstocked? Maybe? If you follow some basics, you can get away with a lot more. Here's what works for me. Multiple filters and heavy filtration. Clean filters often. Large regular water changes. Heavy surface agitation. Heavy flow throughout tank. Don't over feed. In my opinion lack of regular good maintenance will result in much less margin for error. Christian Tinocc and Christian Tinocc like this. For me stocking is one of those things that you can play around with and it is not set in stone. For me good maintenance, the right filtration and stocking the tank with species that utilise different levels of the tank. Has allowed me to keep more fish then running less filtration, having all the fish as just mid level fish and having a so so maintenance routine. Another important factor is oxygen consumption. Greggz hit on this point when he mentioned having plenty of surface agitation which will help increase the amount of available oxygen. It's important to note that higher stocking will mean that your fish will be at a greater risk of running out of oxygen in a power outage when the surface agitation stops. You will also have a much smaller safety margin for available oxygen if you are running CO2 injection or operating at a higher temperature (e.g. in a Discus tank).